I’ve just spent a few hours walking around in the company of historian, Richard Reid. Richard, who works at the National Museum in Canberra is noted for his interest in the history of the Irish in Australia. In particular, his interest in the many young women who came to Australia during or immediately after the Great Famine of the late 1840s. Here in Sydney, the famine is remembered in the Irish Famine Memorial at the Hyde Park Barracks. Reflecting the displacement experienced by the many young women (and all immigrants and refugees, really), part of the wall at the barracks has also been displaced. 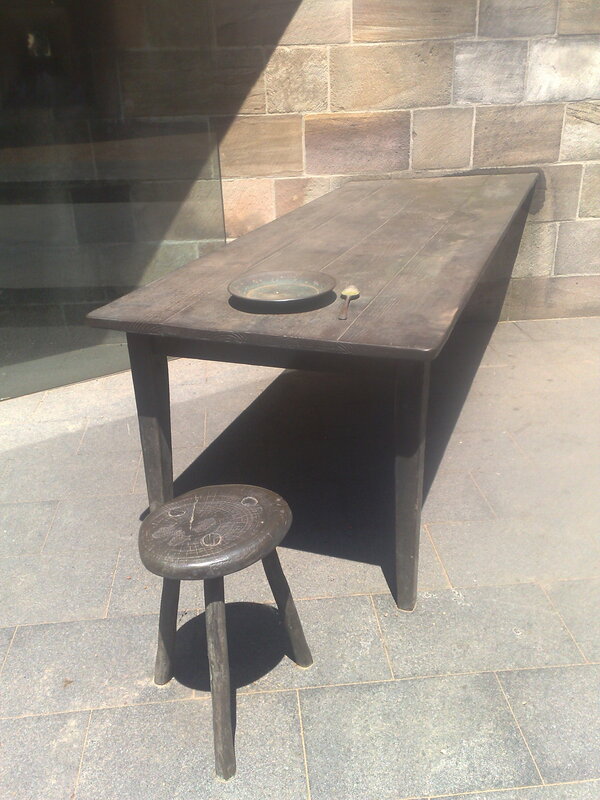 They’ve taken the brick-works, turned them at an angle, inserted a large glass plate with the names of many of the young women engraved, and have placed a small table with some household implements to tell the story of their life before and after arriving in Australia where many gained employment as domestic servants, ahead of marriage. It’s a very touching and beautiful memorial, and I was lucky enough to go along to the launch of the memorial ten years ago. Today’s walk was organised by the Historic Houses Trust, and most of those attending were either trust members, or descendants of many of the famine girls. 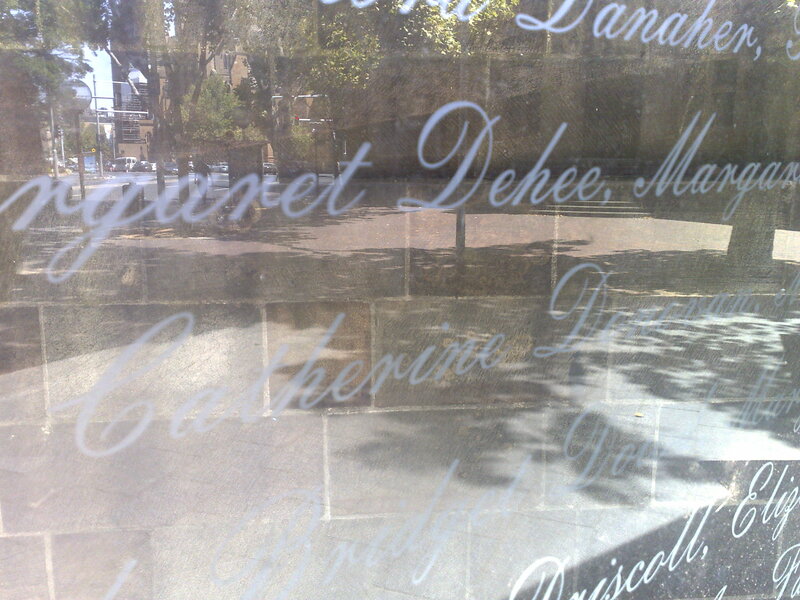 Irish Famine Memorial in Sydney : the names of some of the young women who came to Australia as Assisted Immigrants are engraved in a large glass plate. My own connection isn’t that straight-forward. Strictly speaking my great-grandmother, Hannah Lynch wasn’t one of the “official” famine girls. She didn’t come to Australia on one of the famine ships. But she has a lot of the common characteristics. She came from a town badly affected by the famine. When she came to Australia (along with her sister), her parents were already dead. And she came as an Assisted Immigrant. So although I’m not a direct descendant of these “famine girls”, I was interested in going on the walk to learn more about some of the common issues she may have faced. Of the many points Richard Reid made today one was clear: that although these young women are often described in desperate terms, for most of them a life in Australia was a vast improvement on conditions back in Ireland. Here, they mostly received a regular wage (whereas they would often have experienced large periods of unemployment back in Ireland). And he emphasised that while some of them experienced problems associated with their relocation, the vast majority settled into a reasonably happy life in Australia and just “disappeared”. The walk took us from the steps of the Opera House (they would have arrived at Circular Quay), up Macquarie Street, to Government House (to reflect on the significant number of NSW Govenors who were Irish, and who often did things to improve the conditions of the Irish in Australia), before finally arriving at Hyde Park (where many of these women stayed in the early part of their settlement in Sydney). In terms of my own research, Richard Reid mentioned the availability and importance of weather records in helping to tell the stories of immigration. “The weather which greeted them on arrival would undoubtedly have influenced their impression of life in Australia”, he noted. He also mentioned the “Catholic Weekly” (and before it, “The Freeman’s Journal”), as an historical source (a source which I had given little thought to until today). He also mentioned the opening of an exhibition at the National Museum on March 17, 2010 about the Irish in Australia, and of the forthcoming tenth anniversary of the Famine Memorial at Hyde Park.